Hello there!! It has been a while since I posted, and I have to admit I have been so busy… however a lot has been going on in the environmental scene. So much to keep up with on the ‘Road to Paris’ and the expected El nino. By the way, do you think the downpour yesterday in most parts of the country (Kenya) could be the grand entrance of the el nino? Oh well, I got drenched, and have been thinking much about these rains and the weather, however that is a post for another day. Otherwise I hope you are all well and still have the environment in mind, remember every little effort counts! Another by the way, big shout out to all candidates tackling KCPE this week… and I sure do hope that soon we shall have environmental studies in the primary school syllabus as well as in secondary school as a subject not only a topic. Join me in that prayer! 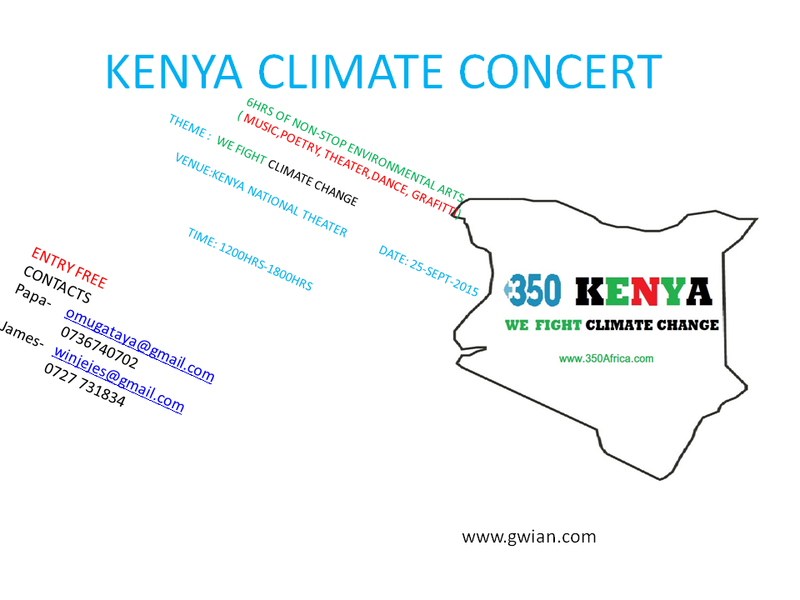 Before I go on, thank you Tess for taking down notes at the Kenya Climate Concert, as I said, you will make a good P.A. 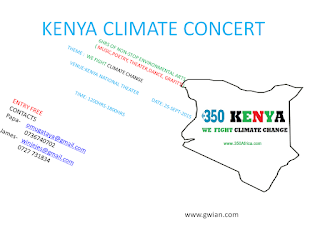 So, the Kenya Climate Concert took place at the Kenya National Theatre in Nairobi on 25th September 2015. It was a beautiful Friday that had been long awaited especially by the event organizers, the 350 Kenya team which I am part of. As we had prepared for the event with the theme ‘We Fight Climate Change’ through arts, music, poetry and dance, I got to the venue with my ‘PA’ at about noon. There was still some setting up going on, as artists prepared and people streamed in. In a short while all was set up and ready to start! The introduction was made, in his words- ‘tell your neighbor the globe is warming!’ With this statement and some giggles from within the crowd, the crowd warmed up and were curious to hear what next. As part of the introduction, it was made clear that #WeFightClimateChange and that the 350 Regional Week of Action had just begun, not only in Kenya but other countries where 350.org is set up such as in South Africa and Jordan. The first presentation was a mix of song, dance and poetry. The poem was on pollution and clearing of forests and the declining of water levels, and it was clear as they said ‘this generation has made an error’. Other than that, the performance also touched on social issues like marriage, which make up part of the social environment. The second presentation was by the eloquent David ‘Reakt’ Wainaina, who was also part of the panelists who discussed the role of an artist in the environment. He also mentioned about the similar concerts on going in sub-Saharan Africa and the 3000 gathered petitions on climate change. 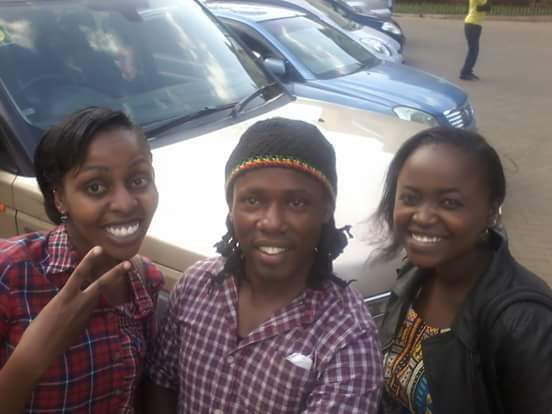 Third came in Christabel Atieno, with African drums beating in the background- I sure did enjoy her performance- on a narrative about the environment and a man named Obiero, who was spotted by Auma and Otieno in Gembe village cutting down trees for firewood and burning of grass. This narrative brought out the aspect of alternative sources of energy, and how harmful others are to our environment leading to the dangerous climate change. From this narrative we learned that through sharing of information and identifying problems we can help to reduce and eradicate harmful practices in our communities. Next on line was a piece on spoken word, which touched on various issues in the environment such as extinction, ozone layer depletion, pollution and waste management leading to environmental degradation. Also, ‘…environment has become an orphan without Wangari Maathai’ was a notable statement, which left many challenged to take up the late Wangari’s mantle. After the spoken word piece, was a duet from the percussion discussion team, which also talked briefly on ‘colored waters’ to mean sewage and its negative effects to public health. The performers then challenged the crowd on the destination of their waste, with an example of plastic papers. After this, two puppets cheered the crowd with their ‘Welcome to the 21st Century: Everything is Becoming Less’ poem. According to me, the most memorable ones were ‘attitude-careless, youth-jobless, government-clueless… however our hopes are endless!’ Do you agree? Fred Nyaga was next with a talk on planting ideas and read a poem on ‘Our Environment Our Liberation’ after which he invited the current Miss Environment who shared on how the beauty pageant creates more awareness on environmental issues. The percussion discussion followed again, with songs to entertain the crowd. Vidze Kaladze performed a Giriama folk song and tried to engage the crowd to join him. After that other music artists entertained the crowd with their own songs, then Belinda from AYICC took the mic and talked about personal awareness on environmental conservation. After her talk was the song performance ‘collective duty’ which highlighted on conservation of the environment. Finally I got to speak briefly on what 350.org is, a global climate movement, and why the number 350 is so significant to us- because its means climate safety, of 350 parts per million (ppm) or less of CO2 in the atmosphere. Currently the amount of CO2 is at 400ppm, which is dangerous leading to global warming and finally climate change. After that I taught the crowd a short dance move, which is basically the Kenyan ‘chini kwa chini’ which I had choreographed in April during the 350.org climate workshop held in Nairobi, which symbolized the gradual reduction of CO2 levels in the atmosphere and maintaining safe levels. 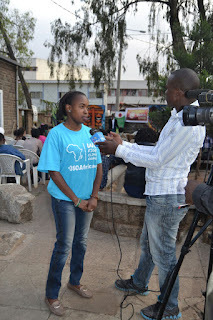 From this point I was interviewed by some of the major media houses in Kenya, such as NTV and gave my opinion on what climate change is, how it is affecting us and what I would like the President of Kenya to address about climate change! I must say I was honoured… As the interview was going on, fellow colleagues took their turns to talk on the issue and also to network! Join us in the battle!